This post is sponsored by Les Trois Petits Cochons. All opinions are my own. 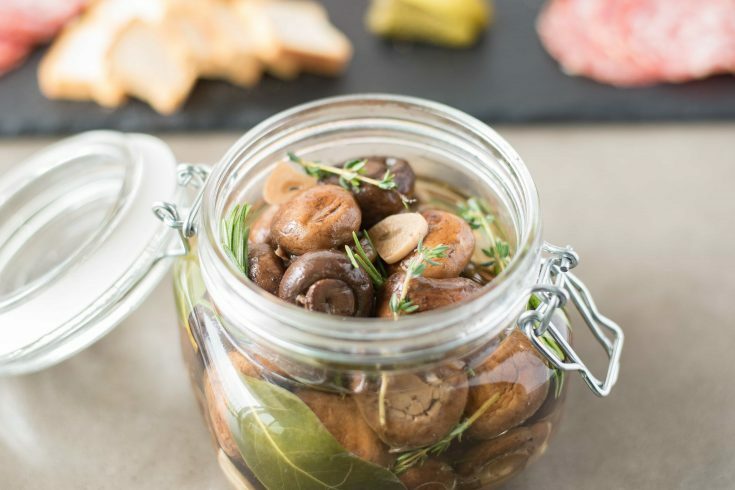 Herb and garlic marinated mushrooms bring something different to a charcuterie board. Mushrooms are cooked with thyme, rosemary, garlic and lemon, then jarred and allowed to marinate to intensify the flavors. 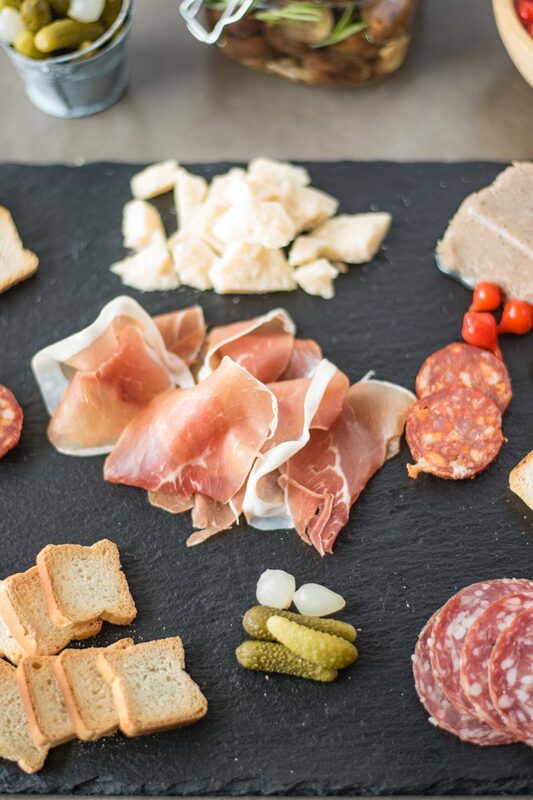 Everyone loves a good charcuterie and there is no more fun way of eating a delicious collection of bites. You can have a bit of this or a bit of that, then go back for more. 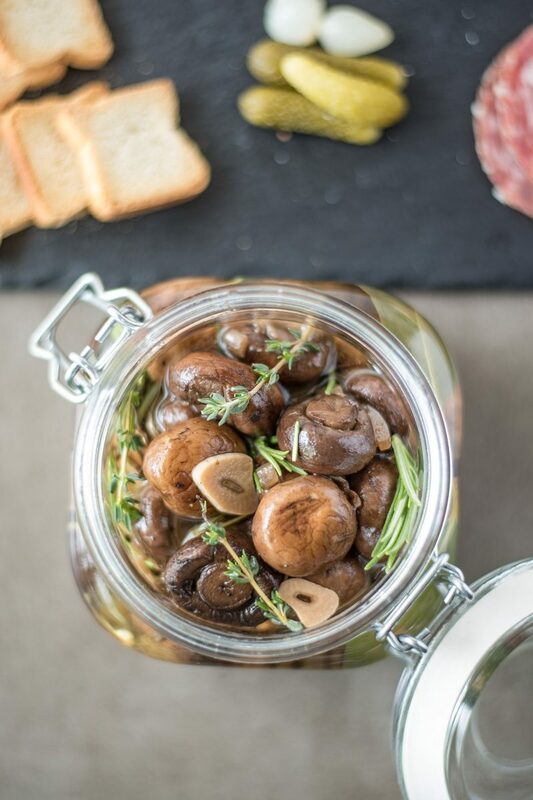 Along with the usual suspects of cured meats, cheese, pâté, pickled items I’m sharing with you my really easy herb and garlic marinated mushrooms that bring a little something different to the board. 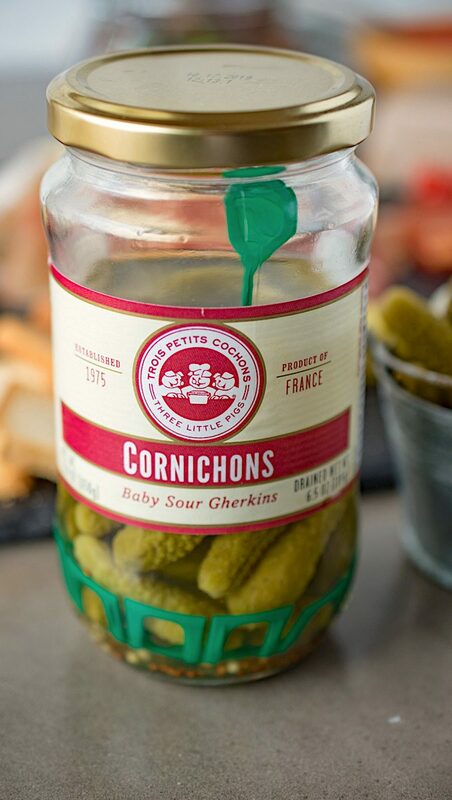 I have been enjoying the products of Les Trois Petits Cochons for many years. You’ve seen their logo of three happy pigs and there variety of products is outstanding. Les Trois Petits Cochons have everything you need to assemble a wonderful charcuterie that can be enjoyed for entertaining, snacking, or in my case ‘Charcuterie At Sea’. I live in a beach/marina community and there is nothing my husband and I enjoy more than taking out a boat and enjoying the ocean and the weather. We always bring along a lot of food and it’s always charcuterie because you can eat at your leisure while boating the seas. 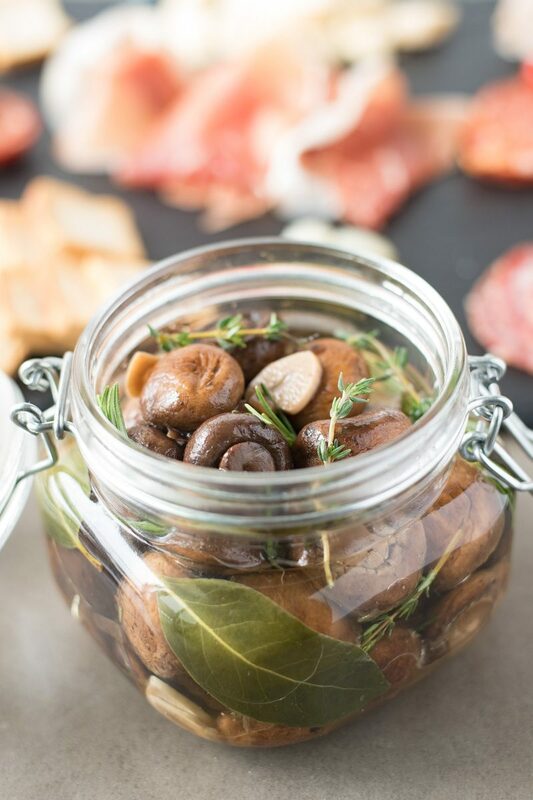 When I make charcuterie, I also like to include something homemade, a simple dish like these herb and garlic marinated mushrooms which are a delicious addition to a charcuterie. These mushrooms are also delicious in salads or as a simple snack enjoyed right out of the jar, like I do. My preference of mushroom for this recipe are cremini or baby bella because they have so much more flavor than regular button mushrooms, but you can pick which mushrooms you like. There’s a lot to choose from. I do like to cook the mushrooms before marinating them. This serves 2 purposes, firstly, they taste better cooked and secondly cooking all the ingredients intensifies the flavors and brings them together for a more flavorful mushroom. To a large sauté pan add 2 tablespoons olive oil over medium heat. Add the mushrooms and shallots cook, stirring often until the shallots soften. Don’t brown. Add the garlic, vinegar, lemon juice , thyme, rosemary, bay leaves, salt, pepper and the ¼ cup olive oil. Stir to mix well and simmer in the liquid for 5 minutes to bring the flavors together and the liquid from the mushrooms has reduced. Transfer to a large bowl and allow to cool to room temperature. Once cooled, transfer to a 20 ounce jar, seal and refrigerate for at least 4 hours up to 5 days. I love mushrooms but I didn’t know how to marinate them! Excellent recipe! I just love marinated mushrooms, there’s a jar in the fridge right now – making them myself? Even better! Thank you for another lovely recipe! My sister is going to love me when I make your marinated mushroom recipe. Seriously, this is one of her favorite things. I remember when she was little and would cry when the marinated mushrooms ran out!! They look delicious! I always bring lots of food when we go boating too! I think I’ll be adding these little babies! 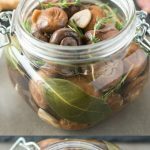 I have always loved marinated mushrooms but used store-bought, I’m pinning your recipe to make them myself on and on and on! I love a good charcuterie board! Mushrooms are one of my favorite things – I can’t wait to make these marinated mushrooms! Hi Jamie, I think any mushrooms would be delicious.